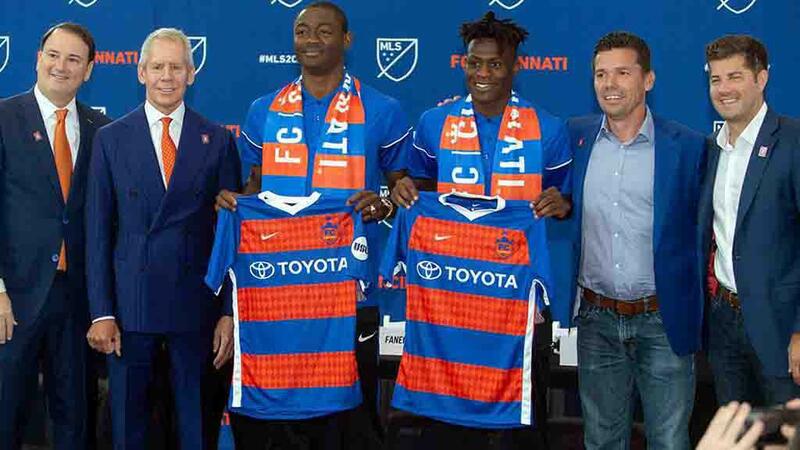 CINCINNATI – FC Cincinnati has made a pair of loan moves that will bring forward Fanendo Adi and midfielder Fatai Alashe to the club for the remainder of the 2018 USL season, pending league and federation approval. Adi arrives on loan from the Portland Timbers and Alashe from the San Jose Earthquakes, with Cincinnati having previously acquired the MLS rights to the players ahead of its move to Major League Soccer for the 2019 season. A 6-foot-4 forward from Lagos, Nigeria, Adi scored 54 goals in 126 games for the Timbers. Adi had notched two 16-goal seasons and one 10-goal campaign in his four-plus years in the Pacific Northwest. He was named MLS Player of the Month in April, 2016 and on four occasions claimed the MLS Player of the Week award. Adi originally came to Portland in May, 2014 on loan from FC Copenhagen, where he had competed in the UEFA Champions League against opponents including Juventus, Real Madrid and Galatasaray. Adi helped the Timbers claim their first MLS Cup in the 2015 season, scoring two goals and recording one assists in the 2015 MLS Cup Playoffs. Alashe is in his fourth season in the professional ranks after having played in the Premier Development League for both Reading United AC and the Portland Timbers U-23s and collegiately for Michigan State University. Selected with the No. 4 pick of the 2015 MLS SuperDraft, Alashe has made 85 appearances in Major League Soccer for the Quakes, notching five goals and three assists. FC Cincinnati will return to action this Saturday night when it plays host to Nashville SC at Nippert Stadium looking to maintain its lead at the top of the USL’s Eastern Conference standings. Kickoff is set for 7:30 p.m. ET, with the game set to be broadcast locally on WSTR 64 and nationally on ESPN+.